Why Should I Get an Oral Cancer Screening? Oral cancer is a prevalent disease that is characterized by malignant cells forming in the mouth and/or throat. The symptoms are typically very subtle, meaning that without a screening the cancer might spread too quickly before it is detected. This is why an oral cancer screening is so important. At The Art of Dentistry, Dr. Robin Rutherford performs this preventative screening utilizing VELscope® Vx technology to detect oral abnormalities before symptoms appear. It can help reveal cancer cells at their earliest stage before they have had the chance to spread elsewhere in the body. 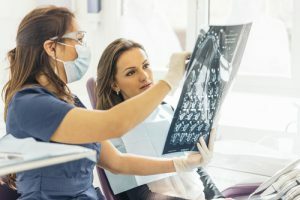 When considering a screening, it is best to visit a medical or dental professional, as they will note a patient’s oral history and ask questions to help unveil any symptoms. The most common causes of oral cancer include tobacco use, heavy alcohol consumption, and the presence of HPV (human papillomavirus). Additional factors that have been linked to a higher risk of the disease include being 40 years or older, excess sun exposure, being genetically predisposed, and eating a diet low in fruits and vegetables. Even if a patient doesn’t fall into one of these groups, it is still good to be proactive and have the screening done twice yearly. Our team would be happy to set up an oral screening for you at your next oral exam with Dr. Rutherford. Please contact our office for an appointment.